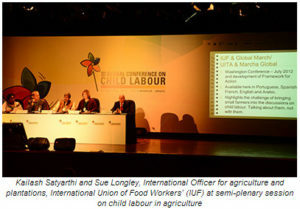 17 October 2013: Global March Against Child Labour marked its prominent presence at the recently held Global Conference on Child Labour in Brazil. The host government had invited Kailash Satyarthi, Chairperson of Global March to represent the civil society fraternity at the opening and closing sessions of the conference. As one of the four constituents of the conference i.e. 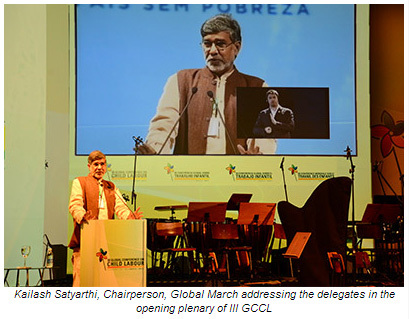 governments, employers’ organisations, workers’ organisations and the civil society, Kailash Satyarthi called upon the 1300 delegates from over 150 countries for bold, innovative, holistic and urgent action against child labour. Three other speakers who spoke in the opening plenary along with Kailash Satyarthi were Brazilian Minister of Social Development and Fight Against Hunger, Tereza Campello; Dutch Minister of Foreign Trade and Development Cooperation, Liliane Ploumen; representative of the International Organization of Employers (IOE), Octavio Carvajal Bustamante and representative of the International Trade Union Confederation (ITUC), Jeroen Beirnaert. The high profile delegation at the conference included representation by ministers from over 37 governments across the world. The governments must spend at least 6% of their respective GDPs on attaining objectives of education for all. Additionally, new and innovative methods must be explored to bridge the gap in financing for education. Donors must fulfil their commitments towards education and should commit adequate resources for child labour elimination. The law enforcement machinery at national levels must undergo qualitative and quantitative overhaul in terms of capacity enhancement to effectively monitor violations of child rights and efficiently deal with such cases. The legal and judicial mechanisms at the national levels must be optimally utilised to hold the perpetrators of child labour, slavery and trafficking accountable. Interagency collaboration should be integrated with convergence of policy and programmatic interventions at grassroots levels, including revitalisation of the Global Task Force on Child Labour and Education. Governments and businesses must inculcate entrepreneurship, employability; empowerment to youth through appropriate educational measures and take appropriate steps for transforming hazardous child labour into decent employment for the youth. Businesses must ensure that their supply chains are free from child labour and other labour rights’ violations. Similarly decent working conditions for adults are non-negotiable. Government agencies must have a child friendly approach towards disaster management. Governments must invest in evidence based research on the impact of ecological imbalance on vulnerability of children. This would be an enabling tool for awareness raising of the policy makers in upholding child rights and for service providers catering towards victims’ assistance. Eradication of child labour must be included in the post 2015 development agenda. UN agency heads must come together on a single platform to give a strong message that child labour is unacceptable. 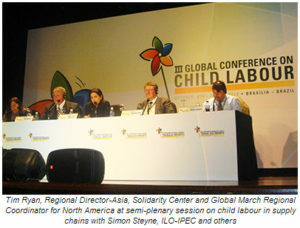 In the preparation for the III GCCL, the International Secretariat of Global March also played an important role in facilitating the child labour dialogues online which entailed discussions on pertinent themes like social protection, education and training, national legislation and enforcement and labour market policy with a varied range of stakeholders from across the world. Global March with ILO, Telefonica Foundation, Government of Brazil launched the Virtual March "For a free world form child labour", an application that allowed Facebook users to protest against child labour. The initiative introduced several innovations of communication, increasing awareness and mobilisation to encourage global participation towards child labour elimination. 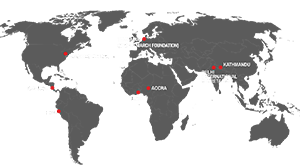 Additionally, Global March members and partners had liaised with their national governments for possible inclusion in their respective delegations to the conference. They also implemented awareness-raising and lobbying campaigns around the conference, its goals and the outcome document, taking into account the national concerns and situations. Partner representatives from Education International (EI) Dominique Marlet, International Union of Food Workers (IUF) Sue Longley, Tim Ryan of Solidarity Center also spoke at the thematic semi-plenary sessions spread over the three day conference. Advocacy meetings were also organised with the national delegations of several countries towards the key campaigns of the Global March focusing on child slavery and trafficking, child labour in agriculture, child domestic labour, child labour in supply chains and promoting multi stakeholder dialogue for enhancing interventions against child labour. At the conference Kailash Satyarthi interacted with over 40 adolescents and young people from 23 Brazilian states to emphasise on the pivotal role that they play in the fight against child labour. The teens were resolute about spreading awareness on the subject of child labour among their peers, relatives and families. They also pledged support for mobilising collective will for rooting child labour out of the system. At the official closing these adolescents presented a charter of demands calling upon the International fraternity to accelerate action against child labour. Global March’s members and partners unequivocally voiced their collective opinion that fight against child labour cannot succeed without an agenda to protect all children from exploitation and to ensure that they benefit from good quality education, decent living standards and fulfilled, safe and happy childhoods. Global March strongly upheld its stand that the issue of child labour cannot be looked in isolation and should be viewed with the lens of overarching cross cutting issues like denial of fundamental and universal rights like right to education and decent working conditions for the adults. 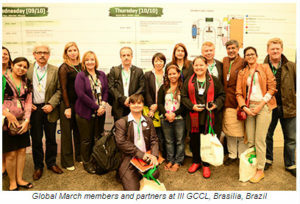 Global March’s key constituent International Trade Union Confederation (ITUC) was an integral part of the drafting committee for the Brasilia Declaration on Child Labour. Global March liaised with the drafting committee for shaping the final declaration to echo the voice and demands of its members and partners at the grassroots. Most of the key concerns of Global March were included in the outcome document. Reminding the stakeholders of their commitments and responsibilities towards the 168 million child labourers that continue to languish day and night, Kailash Satyarthi in the closing session of the conference called upon the global fraternity to do whatever it takes to transform child vulnerability to youth empowerment till we meet next in Argentina in 2017.